DON'T BIN FOOD WASTE - BOKASHI IT! Place all your kitchen waste, (including bones and cooked or uncooked meat) into the airtight container and sprinkle with a handful of supplied Bokashi EM mix (containing organic bran, molasses and EMs, which means Effective Micro-organisms). When full the contents of the Bokashi bin can be safely transferred into a traditional compost bin or simply dug into the garden to attract worms and enrich the soil. The process that takes place in the bin is one of anaerobic (airless) fermentation. The natural EM mix starts to break down the waste inside. After 4-5 days liquid feed can start to be drained off from the bottom (sump) of the bin which is alive with beneficial microbes. This can be diluted as a plant feed or poured down drains to prevent algae build up and prevent odours. This process does not produce foul smells but should give off a distinctive yeasty fermenting smell when opened. It won't attract flies either so the container can be safely kept in the kitchen. Download the Bokashi Tips PDF below for more information. 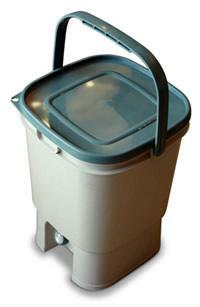 Be the first to submit a review for the Bokashi Japanese Kitchen Waste Bin (18 litres).